About this object Ohio Representative Joseph Keifer served one term as Speaker. Republicans won the House and presidency while the Senate was evenly divided after the 1880 elections. The 47th Congress (1881–1883) focused on immigration: approving a treaty with China to slow the flow of Chinese laborers; passing a Chinese Exclusion Act (after an earlier one had been vetoed); and sending a general immigration act to the President. Congress also appropriated funds for river and harbor projects and for modernizing the U.S. Navy. 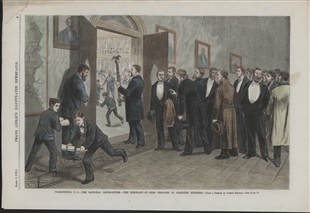 After the trial and execution of President James Garfield’s assassin, a delusional job-seeker, Congress replaced the patronage system with a Civil Service program to hire government workers. 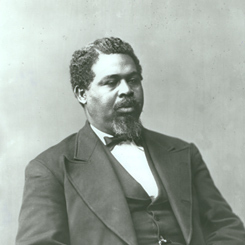 William Henry Smith—a prominent African-American Washingtonian—was appointed Librarian of the House. Roswell P. Flower of New York, in a seemingly unprecedented request, inserted into the Congressional Record a complete, amended copy of the U.S. Constitution. 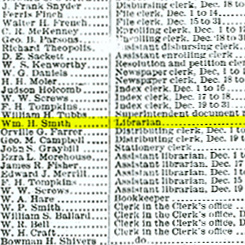 1Available data show that Representative John F. House nominated Samuel J. Randall as the Democratic candidate for Speaker, the traditional role of the caucus chairman. Later data show W.S. Rosecrans issuing the next call for a Democratic Caucus meeting, but there is no evidence to suggest that Rosencrans was actually elected caucus chairman.